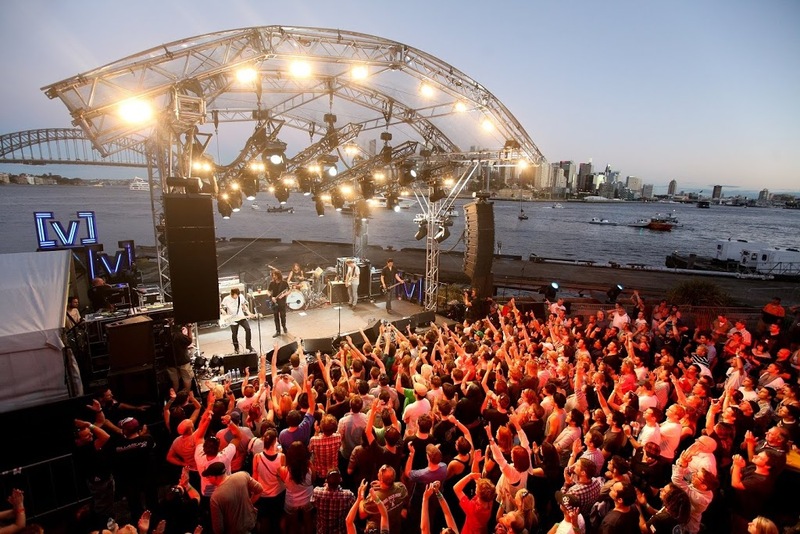 • We know we made mention of the recent Foo Fighters’ gig on Sydney’s Goat Island and the fact that it’ll premiere on Channel [V] this Saturday at 11am, but we couldn’t resist running this rather spectacular photograph (above), sent through from station publicists late yesterday. 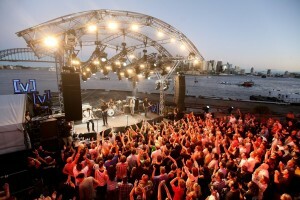 The show will be simulcast on the Triple M network nationally. • Nicole Scherzinger’s new single ‘Don’t Hold Your Breath’ may have found itself in the No.4 position on this week’s Most Added songs to Australian radio, but it’s done so without officially being serviced to radio. The Nova network added the single nationally last week solely on the back of its outstanding performance on the UK chart. Yes, the UK chart! According to our Universal insider, the track will be rush-serviced to radio this week, with a digital release date not far behind. • Jennifer Lopez’ album ‘Love?’ appeared on the local release schedule last week, locked in for an April 22 release. One week later and the album’s local instore date has been delayed to April 29. She remains in the No.1 position on the ARIA singles chart with her current smash ‘On The Floor’. • MTV’s Hits channel will celebrate the release of Lady Gaga’s new album ‘Born This Way’ with a Gaga special on Sunday May 22. Entitled ‘GagaTV’, it’ll air from 10am on the day prior to the album’s official release date. • Something we were completely unaware of is the local digital release of Aqua’s new single ‘How R U Doin?’. It’s available from the local iTunes store HERE. 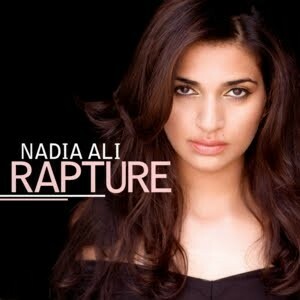 • Singer Nadia Ali first came to prominence as the frontwoman for US dance Iio, which had a hit in 2002 with the single ‘Rapture’. Nine years later, she’s back with the song, though this time it’s produced by Tim Berg under the guise of Avicii. And after conquering the club chart, the song’s been sampled to radio this week. • Also at radio from the Universal stable this week are new singles for Escape The Fate and Imelda May, along with Nicki Minaj’s ‘Moment 4 Life’. • Sony Music has sampled a remix of Jessica Mauboy’s latest single ‘What Happened To Us’, along with the Deadmau5 remix of the Foo Fighters’ ‘Rope’ and the new Vines single ‘Gimme Love’. • And plenty from the team at EMI this week, with new singles from 30 Seconds To Mars, Eli “Paperboy” Reed, King Creosote, About Group, Josh T Pearson and Mirrors. • Brazilian songstress Fernanda Takai will arrive in Australia midway through April for two very special shows. She’ll play the All For Japan Benefit at Canberra’s Playhouse Theatre on April 19 and at The Basement in Sydney on April 20. Tickets are on sale now. • On the UK chart, Nicole Scherzinger has relinquished her No.1 position after just one week, dropping to No.2 and see-sawing with Adele and her megahit ‘Someone Like You’. The Black Eyed Peas’ new single ‘Just Can’t Get Enough’ has soared into the top ten at No.3, while the week’s highest new entry was the Comic Relief duet ‘I Know Him So Well’ by comedian Peter Kay and Sony songstress Susan Boyle at No.11. • And on the British album chart this week, The Strokes can’t budge Adele’s album ’21’ from the No.1 position. They can’t budge Adele’s album ’19’ from the No.2 position either, so they have to settle for a No.3 debut with ‘Angles’. New at No.5 is the Ronan Keating/Burt Bacharach album ‘When Ronan Met Burt’, Nicole Scherzinger’s new album ‘Killer Love’ is in at No.8 and Chris Brown is in at No.10. Duran Duran popped in at No.11 with their new album ‘All You Need Is Now’. The 30STM track is ‘This Is War’. It was originally serviced to radio in March last year, but is back. Same echo123! What 30 Seconds To Mars song are we talking about? Thank you. i know it’s a small thing but i check out every song you put on your site to see if i like it. If it wasn’t for you guys i’d never have come across my three favourite Aussie bands at the moment….Gypsy and the Cat, Buchanan and Tim and Jean. Hi. I love reading News Wrap every week. Just wondering where possible, when you talk about new releases can the name of the song be listed with the artist. Cheers.